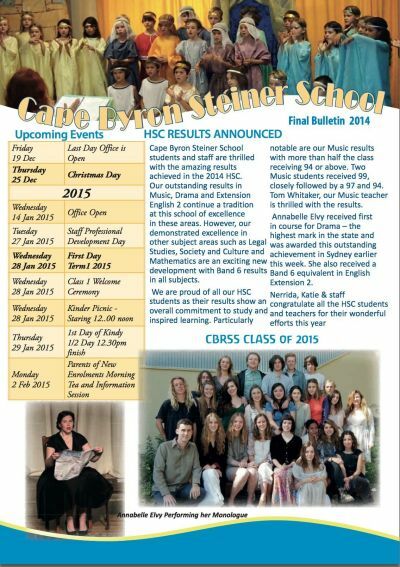 Cape Byron Steiner School students and staff are thrilled with the amazing results achieved in the 2014 HSC. Our outstanding results in Music, Drama and Extension English 2 continue a tradition at this school of excellence in these areas. However, our demonstrated excellence in other subject areas such as Legal Studies, Society and Culture and Mathematics are an exciting new development with Band 6 results in all subjects. 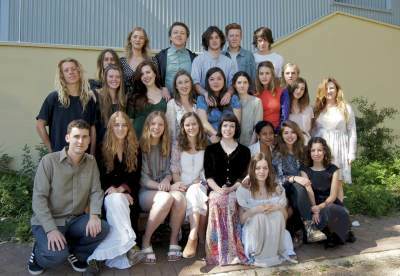 We are proud of all our HSC students as their results show an overall commitment to study and inspired learning. Particularly notable are our Music results with more than half the class receiving 94 or above. 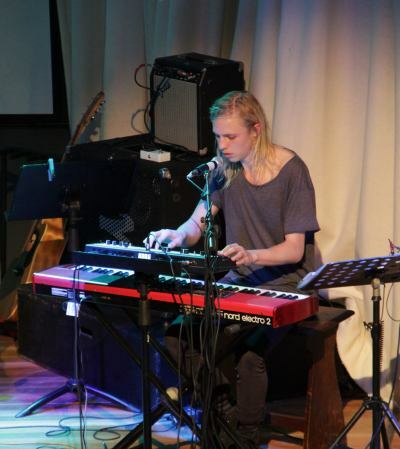 Two Music students received 99, closely followed by a 97 and 94. Tom Whitaker, our Music teacher is thrilled with the results. 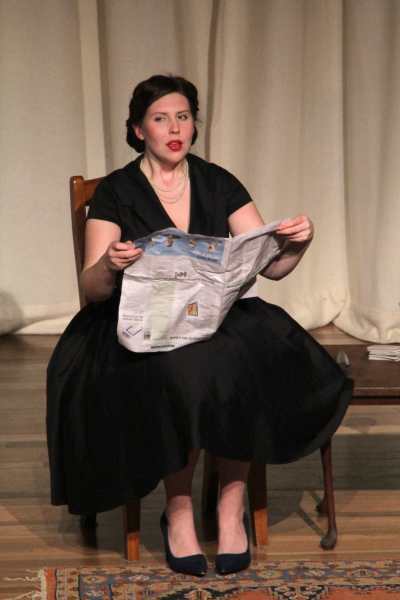 Annabelle Elvy received first in course for Drama – the highest mark in the state and was awarded this outstanding achievement in Sydney earlier this week. She also received a Band 6 equivalent in English Extension 2. With just two weeks left of the school year, there is a real buzz around the school and a lot of different activity happening. 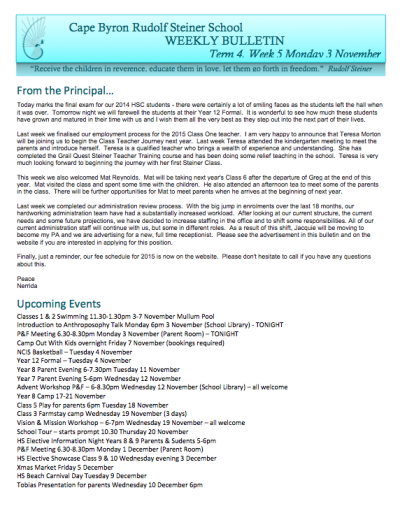 Our calendar of events is very full and staff are busy writing reports, teaching and organising special activities. to see just how much the Class One children have grown and learned this year. The kindergarten children in the audience were looking wide- eyed around the room with the knowledge that, after the holidays, they would be the next Class One. The movement into the seventh year marks such a change in the children and, looking at both the Kindergarten and Class One children in the same room, it was clear to see the difference in their whole beings. One of the great joys of working in a school such as ours is that the teachers really get to focus on observing and understanding the developmental changes happening in the children we teach. Preparations are well underway for our Christmas Concert and Market on Friday 5th December. Please make sure you note this in your diaries, as it is a wonderful opportunity for our school community to come together and share some time at the close of the school year. Finally, today we unveiled a plaque and two of our senior students planted a persimmon tree in memory of John O’Brien, Principal of the school in 2010 and 2011. A number of staff spoke of their fond memories of John, with stories being told of his warmth, sense of humour and love for the school and the students. The plaque and tree will stand as a tribute to a lovely man who touched the hearts of many in our community. making their way back to the school and I am sure they will have many wonderful stories to tell. talk about the theories of their chosen philosophers. presentations. Please do keep an eye on the calendar for events which may interest or involve you. will assist us with the further development of our Strategic Plan. 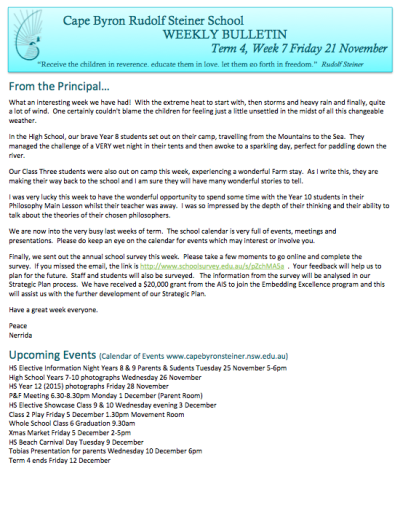 Another busy week has passed with some important events in the life of our school community. The passing of our much-loved former Principal, John O’Brien, was a sad event and I attended his funeral today, along with a group of teachers and support staff. Katie and Greg spoke beautifully of their memories of John’s time as Principal at CBRSS. Last week we also said goodbye to the 2014 Year 12 Class at their final Class formal. With the need for study now over, it was great to see the students all dressed up and enjoying themselves with parents and teachers at the Byron Beach Cafe. This week you will receive a copy of our annual school community survey. Some of the questions on the survey are specifically designed to assist us with our strategic plan process. Your help in completing the survey as soon as possible after you receive it would be most appreciated. Over the last few weeks I have received some excellent feedback from students and parents in relation to a range of issues around the school. Your constructive feedback is always very welcome as it can assist us reflect and make improvements to our wonderful school. Positive comments and affirmations are always welcome too! Today marks the final exam for our 2014 HSC students – there were certainly a lot of smiling faces as the students left the hall when it was over. 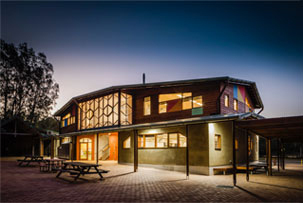 Tomorrow night we will farewell the students at their Year 12 Formal. It is wonderful to see how much these students have grown and matured in their time with us and I wish them all the very best as they step out into the next part of their lives. Last week we finalised our employment process for the 2015 Class One teacher. I am very happy to announce that Teresa Morton will be joining us to begin the Class Teacher Journey next year. Last week Teresa attended the kindergarten meeting to meet the parents and introduce herself. Teresa is a qualified teacher who brings a wealth of experience and understanding. She has completed the Grail Quest Steiner Teacher Training course and has been doing some relief teaching in the school. Teresa is very much looking forward to beginning the journey with her first Steiner Class. This week we also welcomed Mat Reynolds. Mat will be taking next year’s Class 6 after the departure of Greg at the end of this year. Mat visited the class and spent some time with the children. He also attended an afternoon tea to meet some of the parents in the class. There will be further opportunities for Mat to meet parents when he arrives at the beginning of next year. Last week we completed our administration review process. With the big jump in enrolments over the last 18 months, our hardworking administration team have had a substantially increased workload. After looking at our current structure, the current needs and some future projections, we have decided to increase staffing in the office and to shift some responsibilities. All of our current administration staff will continue with us, but some in different roles. As a result of this shift, Jacquie will be moving to become my PA and we are advertising for a new, full time receptionist. Please see the advertisement in this bulletin and on the website if you are interested in applying for this position. Finally, just a reminder, our fee schedule for 2015 is now on the website. Please don’t hesitate to call if you have any questions about this. This week I walked around the school and saw teachers working with such skill and care, I saw students laughing, singing and working and I saw our wonderful Administration and Support Crew cheerfully working together to support the school. It struck me that the school is often a haven of calm and warmth in a world which can seem increasingly frightening. Almost every news story at the moment is filled with things designed to make us fearful, worried and at a high state of alert. This makes it all the more important that school can be a place of calm for our students, a place of truth, beauty and goodness. I am grateful to our staff and school community for continuing work to ensure that our school remains just such a haven for our students. Finally, just a reminder that we have a really wonderful library of Steiner related literature in the library. Please do go in and have a chat to Charlotte if you would like to borrow some of our wonderful Steiner resources and find out a little more about the philosophy that underpins our education. 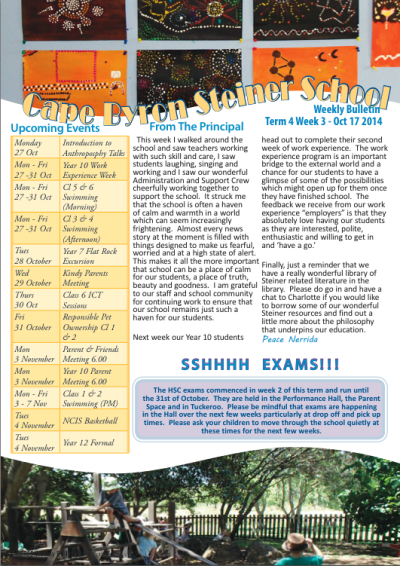 A new term has started and it is hard to believe we are into the final term for the year. It was wonderful to see our students streaming back into the school with happy faces and many stories of their holiday break adventures. From next week, our 2014 HSC students will begin sitting their exams. This means we all need to take extra care to be quiet around the exam rooms whilst exams are in progress. There will be really clear signage to indicate when exams are in progress and particular care needs to be taken around the performance hall at drop-off and pick up times. Whilst I am on the subject of drop-off and pick-ups, many of you will have noticed that we have made modifications to our bottom car-park to make it safer and a little more weather-proof. There is now a one-way loop and clear parking spaces. Early reports are that this is working quite well, however we will continue to monitor this and I welcome your feedback. We will be creating a new garden to replace the garden that was in the carpark early next year. 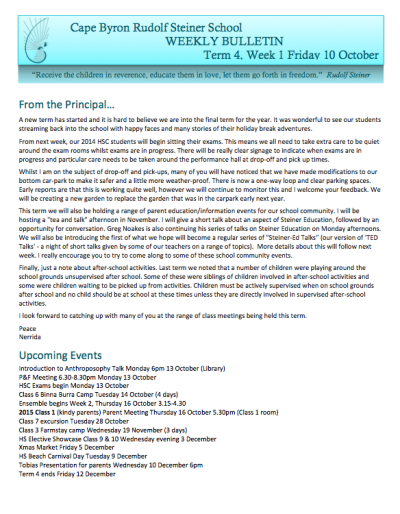 This term we will also be holding a range of parent education/information events for our school community. I will be hosting a “tea and talk” afternoon in November. I will give a short talk about an aspect of Steiner Education, followed by an opportunity for conversation. 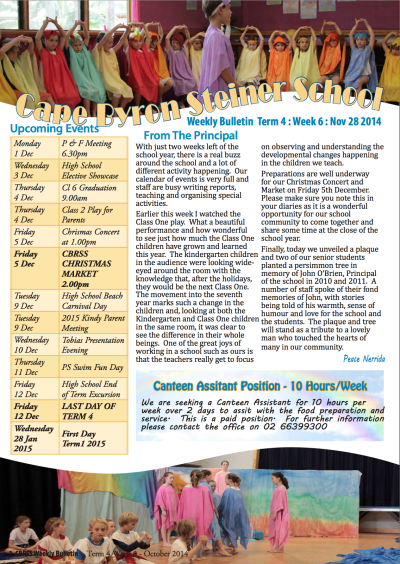 Greg Noakes is also continuing his series of talks on Steiner Education on Monday afternoons. We will also be introducing the first of what we hope will become a regular series of “Steiner-Ed Talks” (our version of ‘TED Talks’ – a night of short talks given by some of our teachers on a range of topics). More details about this will follow next week. 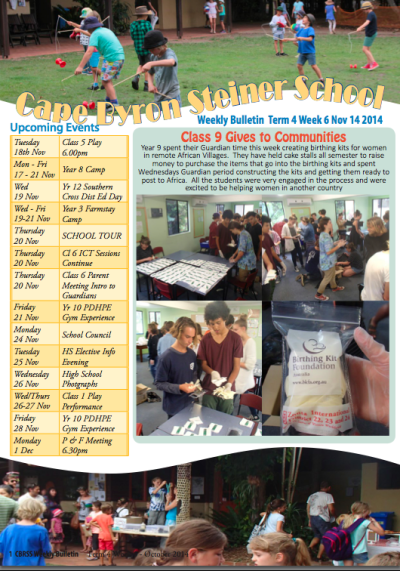 I really encourage you to try to come along to some of these school community events. Finally, just a note about after-school activities. Last term we noted that a number of children were playing around the school grounds unsupervised after school. Some of these were siblings of children involved in after-school activities and some were children waiting to be picked up from activities. Children must be actively supervised when on school grounds after school and no child should be at school at these times unless they are directly involved in supervised after-school activities. 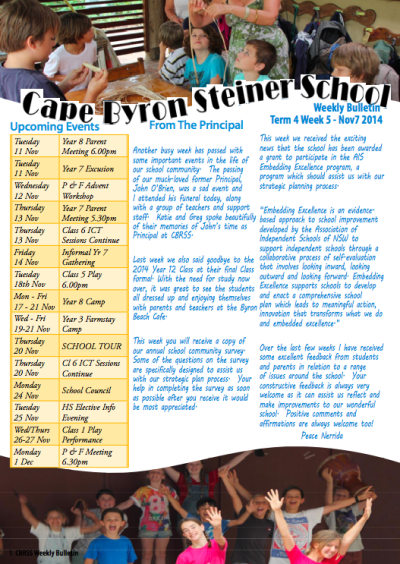 I look forward to catching up with many of you at the range of class meetings being held this term.